At PAX East 2019, we made our way through the busy show floor each day admiring all of the interesting games on display. When we found ourselves in front of the Layers of Fear 2 booth, we jumped at the opportunity to sink our teeth into the demo. Having thoroughly enjoyed the first game, we were admittedly curious to learn more about what Layers of Fear 2 has to offer. 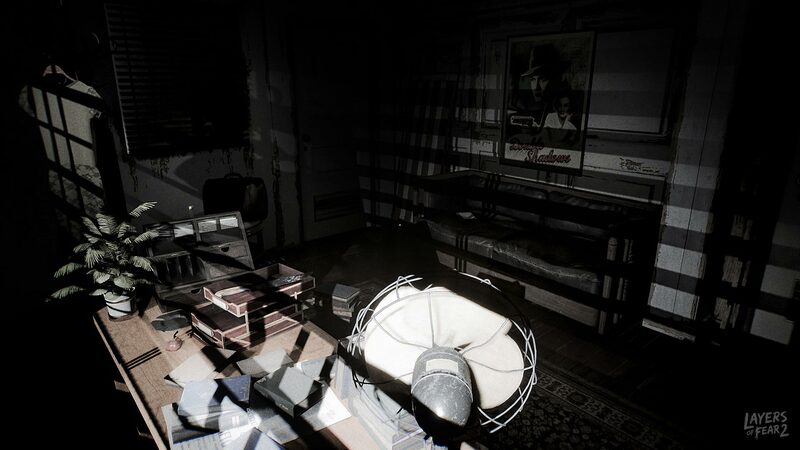 Developed by Bloober Team (Layers of Fear, Observer) and published by Gun Media (Breach & Clear, Friday the 13th: The Game), Layers of Fear 2 offers a slightly different story and concept from the first game. In the original Layers of Fear, players followed the story of a deranged painter on a mission to complete his Magnum Opus by any means necessary. What set Layers of Fear apart from other indie horror titles was its heavy emphasis is placed on slow exploration, and this style also appears to be present in Layers of Fear 2. Of course, based on the outcome of Layers of Fear, it makes sense that Layers of Fear 2 would follow a different character. This time, the game is set during the Golden Age of Hollywood rather than in a gothic Victorian mansion. Layers of Fear 2 follows an actor who takes a mysterious role aboard a luxury ship. After an actor takes a mysterious new role, he finds himself aboard a luxury ship referred to as the "Royal Atlantic Line" which runs from Europe to America. Inside the ship, you’ll notice everything boasts a distinct “1930s” feel. As you orient yourself to this new setting, you’ll have the opportunity to learn more about the main character and the complicated predicament he now finds himself in. During our time with the demo, we were able to explore a few small parts of the ship from tight corridors to a shadowy dining area. Complementing the game’s setting, players can enjoy chilling narration courtesy of Tony Todd, whom you may know from his work in the horror film, Candyman. 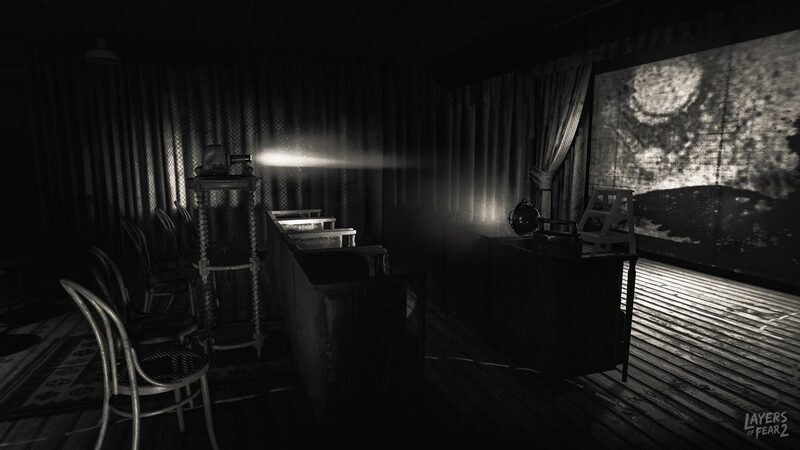 In place of the dynamic paintings found in the first Layers of Fear, Layers of Fear 2 feeds you story through conveniently placed projectors and what appears to be 35 mm film which you’ll need to hook up and play in order to advance certain parts of the story. Additionally, there are phonographs aboard the ship that work in a similar fashion to the projectors. The story unravels through the use of classic projectors and phonographs, along with items you can pick up and inspect. Among the weirdness found in Layers of Fear 2, some of the standouts for us included following trails of fruit littered along the floor, and having to slowly back away from dozens of hands reaching out of the walls along one of the ship’s corridors. There were no jump scares to be found, but rather a growing sense of dread. As you make your way through the ship’s decadent interior, it quickly becomes clear that something isn’t right. The emptiness of the ship, mixed with Tony Todd’s narration and things like well-placed, faceless mannequins help create a cold sweat on the back of your neck. From a visual standpoint, Layers of Fear 2 is a clear upgrade from the original which was released back in 2019. Everything feels crisp and responsive, and the level design itself is superb. Even the mystery of the character feels refreshing, with concepts like “you became an actor so you wouldn’t have to be yourself” (as noted on the game’s official website) lingering in the backdrop. While brief, the demo left us eager to grab the game once it becomes available. As of right now, there’s no set release date for Layers of Fear 2 outside the general “2019” window. Be sure to check back, as we’ll be posting updates on Layers of Fear 2 as they become available. For more info on Layers of Fear 2, be sure to check out the game’s official website, and the trailer down below!